THIRTEEN minutes is a short time to savour your first derby but that was all the time allotted to young Scott Crabbe, the Hearts forward who was carried off after that period at Tynecastle. Happily for him, the reckless tackle which ought to have earned Gordon Hunter a red card did not cause as much damage as was feared. The bad bruising left him with a limp but he will be back in action soon. His enforced exit was a depressing anti-climax for the 21-year-old who has quickly established his claim to a regular and important part in the team this season after a lengthy apprenticeship at the club. Crabbe himself had a miserable afternoon as he lay in the dressing-room trying to interpret the rise and fall of the noise from the terracings. Hearts’ defence was sound throughout, especially captain Dave McPherson who played with a pain-killing injection for the stress fracture he has suffered in his foot. The goal was scored by the Yugoslav Hrusef Musemic. who headed Kirkwood’s free kick powerfully over the line. Hibs manager Alex Miller stared in disbelief as his players committed the very sin of slack marking which he had worked with them all week to prevent. for those who, like Miller, are still allowed in there. If that was a rare piece of initiative in front of goal by Hearts, Hibs did not manage anything remotely comparable. Miller’s view that his team could have played all day and not scored was accurate enough. We were of the opinion that they had played all day. Hearts, too, for that matter, as the drab ball-battering ritual went on under appropriately weeping skies. There was no complaint about the work rate, of course, but customers deserve something more from premier teams. The midfield players spent a great deal of time as if watching a ping-pong game in the sky, the ball flashing back and forth above their heads. 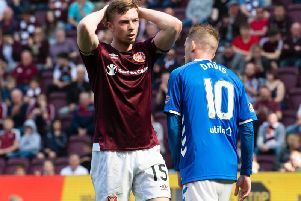 “I think there were two moves of three passes or more, one by us and one by Hearts,” said Miller. He did well to spot them. Unlike other beaten managers, the Hibs man had the honesty to see it as it really was, rather than manufacture excuses. It was a bad day for him as he had heard earlier in the day of the terrible leg break sustained by his 19-year-old player, Danny Lennon, during the reserve derby at Easter Road. Miller, who went to see the lad in hospital on Saturday night, was clearly distressed by the injury which was diagnosed as a double fracture of the tibia. “Anyone who knows him will tell you he is a great boy to have around the place and a very promising player. Knowing his spirit I am sure he will be back as cheery as ever,” said the manager. We would all echo those sentiments. HEARTS: Smith, McLaren, Whittaker, Kirkwood, Levein, McPherson, Colquhoun, Mackay, Musemic, Crabbe, Bannon. Subs: Kidd, Ferguson. HIBS: Goram, Kane, Sneddon, Cooper, Mitchell, Hunter, Weir, Orr, Houchen, Collins, Findlay. Subs: Evans, Hamilton. Referee: K J Hope (Glasgow).